n 2070 Earth's weather is controlled with ease from the Moon. 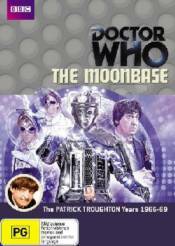 When the TARDIS arrives at the Moonbase, the Doctor, along with his friends Polly, Ben and Jamie are accused of starting a plague that is killing off the base's crew. It's not long, however, before the time travellers discover the true cause of the deaths - a powerful, unstoppable race that the Doctor has met before: the Cybermen. This classic Second Doctor adventure is complete at last with two animated episodes!